Sport Finance-3rd Edition 3 Edition "Sport Finance, Third Edition," grounds students in the real world of financial management in sport, showing them how to apply financial concepts and appreciate the importance of finance in establishing sound sport management practices. Thoroughly updated to address the challenges facing todays professionals, this text engages students with a practical approach to traditionally difficult financial skills and principles. 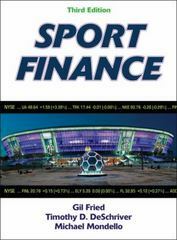 This edition of "Sport Finance" contains several new chapters and a greater emphasis on practical applications to better prepare students for the challenges they will face in the dynamic sport industry. New coauthor Mike Mondello brings additional financial expertise and practical knowledge to the expert author team, ensuring strong coverage of issues critical to the field. A new Budgeting 101 chapter provides a strong foundation for students to build on before delving into the influences on finance, capital structuring, financial management, and profits and losses. The final section of the text is completely new and covers current issues affecting the sport industry, providing realistic context for students entering the workforce. Readers will learn how various sport entities are dealing with the effects of recession and analyze the unique issues that affect various segments of the industry, including nonprofit, high school, college, professional, sporting goods, and international sport. Running case studies from the previous edition have been replaced with one comprehensive case study for a Division II athletic department in the final chapter. Students are encouraged to apply their knowledge as they explore the various revenues, expenses, and other financial issues occurring over the course of a year. Teaching readers skills that will help them understand the drivers of financial success or failure in the sport industry, the text presents these features: - Mid-chapter sidebars that provide practical applications based on topics of discussion - End-of-chapter discussion questions that channel dialogue in the classroom - Expanded ancillary materials, including a test package, presentation package, and instructor guide, that help create an exciting classroom environment "Sport Finance, Third Edition," allows students to grasp fundamental concepts in sport finance, even if they have not previously studied finance. By analyzing business structures, income statements, and funding options, students not only will learn basic finance, but they will also understand how those skills are used in the world of sport. This practical application of the text will help students apply financial concepts in their future careers and will allow professionals to further develop strategies and investment plans in the industry.